I don’t enjoy complaining, but sometimes it’s the only honest way to go. Most of the following is a complaint – so if you’re not in the mood, stop reading or listening now! t’s been nearly a year since I was last able to see one of the Live Broadcasts from the National Theatre, which means I’ve missed at least four performances. Circumstances conspired against me. But it was with great pleasure that I realised on Thursday last week there was still one performance left of the season, and that nothing stood in the way of my seeing The Cherry Orchard with Zoë Wannamaker as Ranevskaya. I booked a seat over the Internet and headed off into town at about 7 pm. Neither suspended public transport nor thunder-threatening clouds could put me off, and I was in time to pick up my ticket at Cinema Bio Roy just before the performance was due to start. It was soon apparent that I needn’t have stressed. Technical problems left us with a blank screen and the message that there was “No or bad signal” – still this did give us something to chat about with our neighbours in the cinema. Apparently, it wasn’t just us. All of Sweden was experiencing the same difficulty. The rumour went around that the start of the performance in London would be delayed until our technical problems were fixed. People said: “It had happened before.” That turned out to be as reliable as rumours generally are. It took about 20-25 minutes to fix the reception. Perhaps we didn’t miss all that much of the play, if the NT started by interviewing the producer, or giving some background info as they did for the first four NT Live plays. Still, when at last we were able to see the play, the actors were well into the first act. Also, there was a noticeable lag between the sound of the voices and the movement of the actors’ lips on the screen. That caused my heart to drop (remembering the experience of All’s Well that Ends Well in which the actors and their voices were slightly out of sync for the whole performance) but this problem too was fixed within two or three minutes, and I settled back at last to enjoy the play. But no! It seems the NT has taken to adding English subtitles. When did that happen? The first four plays were blessedly free of such distractions. Have they introduced subtitling this season? Or is it new for The Cherry Orchard? The titles are rather large, very bright and fill the bottom fifth of the screen. Now, I’m used to subtitles on Swedish TV, and I’m used to them also, when I go to the cinema here in Sweden (though I think they don’t take up nearly as much space on the screen). On this occasion, though, I found them very obtrusive. Apart from the physical feeling I was craning my neck to watch the play over the top of a blindingly whitewashed five-bar gate, the subtitles also raised a psychological barrier in my mind. They emphasised the distance between the audience and the players in a way that was not alienating so much as banal. I mean, they detracted from the feeling that I was observing a real-time performance and instead gave me the feeling I was watching a dime-a-dozen film, and a rather wooden film that. In a theatre the actors are committed to behaving in a very different way from when they are in front of a camera. They must project their voices to reach the back of the theatre, they must enunciate, they must move in certain ways so as not to block the audience’s view. There is no one to shout “cut”, there’s no one going to ask them to take it again – everything has to be done in the moment. Going to see an NT Live performance, I allow for it. I forgive some of the theatricality because of the delight I experience in the feeling of being in a front row seat or VIP box that the close up screen images of the actors gives me. But not this time. The subtitling kept tricking me into thinking I was watching a poorly edited film rather than a rather well-performed play. Another thing I have against subtitles is that I cannot keep myself from reading the bloody things! So in the course of the performance I find myself not only craning and straining, but also reading the words on the screen and comparing what I read to what’s being said. Of course, the subtitles had been created in advance, but it seemed they hadn’t been made with full attention to detail. Far too often the words the actors spoke were either twisted by the subtitles or predicted by them – I mean significant pauses were completely obviated by the fact that what the actor was going to say was already present on the screen. Furthermore, spelling mistakes were also a distraction: I suspect for example, the script actually called for the actors to use the word “deviance” and not “deviants” as the subtitles insisted. I wonder why subtitles are being used now? Is this going to be a regular feature in future? Are subtitles also to be seen in British or American cinemas? Is the non-English speaker audience so big and have they protested so vocally about having to listen to English without subtitles? All this carping may suggest that I did not enjoy the performance. It’s not entirely true. The acting was perhaps a little melodramatic or a little mannered in places (or seemed to be because of my mental conviction that I wasn’t watching a play) but certainly Conleth Hill as Lopakhin, James Laurenson as Gayev and Claudia Blakely and Charity Wakefield as the sisters were very good. Both Zoë Wanamaker, and Mark Bonner as the tutor, coped well with some speeches that must have been a trial in rehearsal. The play as performed was in a new translation – a new “version” – by Andrew Upton. The introduction of modern slang and turns of phrase were, I felt, while sometimes appropriate also sometimes jarring. There are clearly parallels to be drawn between immediately pre-revolutionary Russia and our own age, and the language certainly helped to stress these. But frequent references to specifically 19th-century Russian circumstances (the liberation of the serfs and all the concomitant social upheaval for example) kept re-establishing the historical context of the play and distancing it, in my mind at least, from the modern world. I read somewhere that this production of the play emphasises the political rather than the personal. I suppose that means the prominence given to Petya the tutor’s harangues, and to Lopakhin’s “holiday homes in the country” plans, but, honestly, I thought the play was still far more about personal relationships, about dreams and memory, hopes and fears, devotion and indifference. I think it’s a testament to the strength of the play and the work of the performers that despite all the distractions and all my criticism here, I was among the small cadre in the cinema to join in the applause at the National when the actors came on for their curtain call. Nevertheless, of the five NT Live broadcast plays I’ve seen now, this was the one that impressed me the least. As we left the cinema, Bio Roy staff handed out vouchers to the value of 90 Swedish crowns as an apology for the technical problems at the start. That was nice – 45% off the next NT Live show here (if the prices don’t go up next season). I’ll definitely try to see another performance. The cumulative positive experiences from the first four plays still outweigh the negative impressions of this one. But NT Live Please Note! If I’m forced to peer at another play over the top of a bar of subtitles, that will be the last. 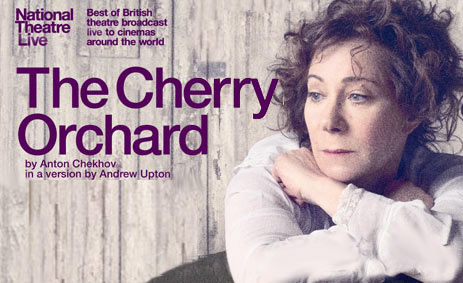 The National Theatre’s production of The Cherry Orchard by Anton Chekov in a version by Andrew Upton, Directed by Howard Davies and starring Zoë Wanamaker was broadcast by NTLive on the evening of Thursday 30th June 2011. The illustrations used on this page are all taken from the official poster for the broadcast culled from other Internet sites as the NTLive are puzzlingly ungenerous about making even this one image widely available. The face is that of Zoë Wannamaker in character as Lyuba Ranevskaya. The Cherry Orchard Review by John Nixon, TheSupercargo is licensed under a Creative Commons Attribution-NonCommercial-ShareAlike 3.0 Unported License. Based on a work at thesupercargo.com. Permissions beyond the scope of this license may be available at http://thesupercargo.com/contact/.